Nimbus captures a transitory moment of presence in a specific location. They can be interpreted as a sign of loss or becoming, or just as a fragment from a classical painting. People have always had a strong metaphysical connection to clouds and projected many ideas on them. Interested in the temporary aspect, Smilde presents the few seconds before the clouds fall apart again. Thefunctionunctions as a document of something that happened on a specific location and is now gone. 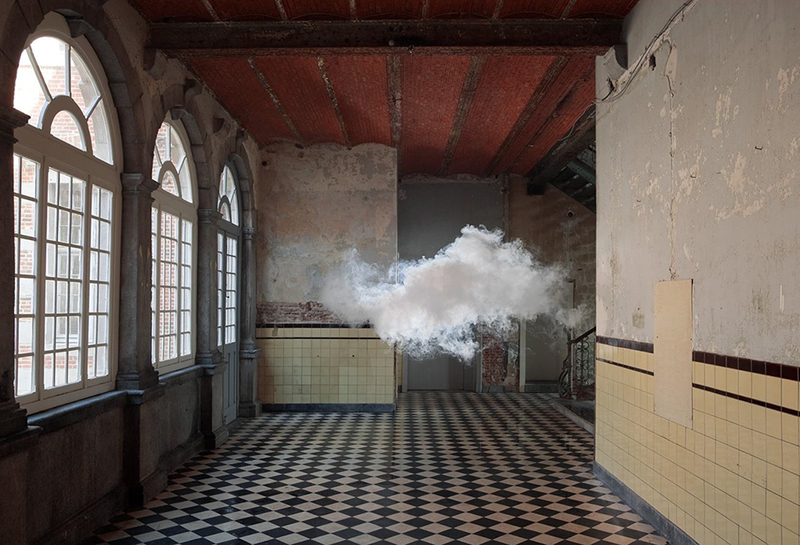 Berndnaut Smilde lives and works in Amsterdam. His work consists of installations, sculptures, and photos. Using his daily surroundings and spaces as motives, Smilde is interested in the temporal nature of construction and deconstruction. His work refers to both the physical state of a building as well as a moment of revelation that depicts either hope or fragility. Smilde analyses spaces and their appearance and takes them apart to investigate their unique details and features. His artistic point of view often centers on duality. His works question: inside and outside, temporality, size, the function of materials and architectural elements. He has exhibited across The Netherlands and also in Toronto, Taipei, Istanbul, Dublin, Paris, London and San Francisco. In 2013, he opened his first large-scale solo exhibition in the US at Land of Tomorrow in Louisville, Kentucky, and guest curated a show at the Bonnefantenmuseum in Maastricht. His Nimbus series was recognised by TIME Magazine as one of the “Top Ten Inventions of 2012”. Smilde received his BA in 2001 from the Minerva Academy and his MA in 2005 from the Frank Mohr Institute, both in The Netherlands.